I don?��Ǩ�Ѣt recall ever being able to draw well. Last year I started reading Drawing on the Right Side of the Brain. I enjoyed the reading and psychology part, but I found the drawing part rather laborious and other things began sucking up my time until I stopped. One year later, I am learning to draw again?��Ǩ���this time, under the direction of CMU?��Ǩ�Ѣs Mark Mentzer. We started with straight lines. Freehand. One inch. Proved challenging. Apparently my idea of an inch is about 7/8 of an inch. This means I have not been selling myself short. 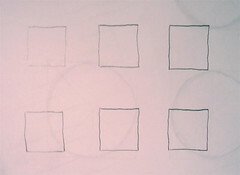 Then we drew one-inch squares. Then circles. And then we experimented with weights and their effects. My squares and circles weren’t too bad. But I did get frustrated along the way, as is the case with most things that I cannot do well but want to do well. Our homework assignment is to draw a room and through lines or squiggles or whatever show how that room is used or how light affects the room or heat or sound. I started and put lines all over the place and it looks pretty gay, so I decided to procrastinate by blogging. We have to hang these on the wall tomorrow morning and try to figure out what is going on. Ah motivation. Mark told us to get a 2B and 4B pencil, one Prismacolor black pencil and one white pencil, two gray value markers (30% and 50%), a black felt tip pen, and a Sharpie, preferably chisel tip. As I do actually want to be able to draw well, and because buying lots of drawing supplies is a lot easier than drawing itself, I happily obliged. So at least in the purchasing of drawing supplies, I have succeeded. That?��Ǩ�Ѣs enough for now to keep me going. Now, back to the you-know-what.